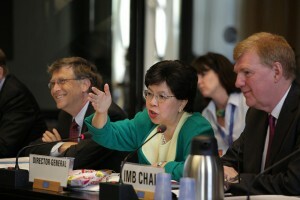 Based on various momentums, the World Health Assembly 64.9 in 2011, had moved Universal health coverage (UHC) from the Geneva-based Health Ministers discussion at the World Health Assembly to a New York-based United Nations General Assembly discussion led by Heads of State and Ministers of Foreign Affairs. This paper analyzed the processes for which UHC agenda was set at global and national level. At global level, the seven like-minded countries in the Foreign Policy and Global Health group, in consultations extensively with all missions in Geneva and New York managed the unanimous adoption of UN General Assembly Resolution A/67/L.36. At national level, adopting UHC agenda is as challenging as implementing it with a good outcome; strengthening health delivery systems and sustained political commitments are vital.